Current Itinerary: We’re leaving here in about an hour headed to a small city called Lanquin that is near Semuc Champey (I was there in ’05). From there we’re heading to a place called Rio Dulce on Lago Izabal with our new traveling companions, Nick and Tracy/England. We’ll likely head down to Antigua from there and then on to Lago Atitlan to hike some volcanoes. We got up extra early in our hotel in Cozumel...we knew we would leave that afternoon, but we still had our moped for a few hours and wanted to go spend a little more time cruising the beaches on the east side of the island. We headed down the highway and found ourselves getting there in no time...although going against a pretty strong head wind. We cruised along and it was even more spectacular in the morning than it had been the previous day...plus since it was early in the morning and a Monday, there was almost no one else out there. We found a beautiful little cove and hung out there for about an hour. Around 10:30, we had to head back to our hotel. We turned in our moped and went back to our rooms and packed everything up. It was nice to spend a couple days in Cozumel and we certainly had a blast...and although it was an expensive couple of days...it was more than worth the stop. Anyone who decides to go there, plan on renting a car/moped and spend some time cruising around the island and get to know some of it’s hidden gems away from the touristy center. The island really has a lot to offer. We boarded the ferry back to Playa Del Carmen around 1:00...we arrived and immediately went to the Kombi’s headed towards to Tulum. Finally we were heading south to get ourselves to Belize...but we wanted to stop to see some Cenotes (underground pools) before we left as this area is famous for them. We arrived in Tulum around 3:00 in the afternoon...and it was a skorcher. Probably one of the warmest days we've had so far...or atleast the most humid. We checked in to a hostel called the Weary traveler...cool name for what seemed like a pretty cool hostel. One thing was new here that I had never seen before...they give you a bracelet with a number on it and you use that to do everything...drink at the bar, eat (they served food), and do just about everything else and then you pay for everything at the end when you check out. Interesting concept that I've heard of for fancy hotels and cruise ships, but never in a hostel. There were no doubles available so we had to sleep in the dorm rooms for the first time on the trip. I don't mind the dorms too much...the only downside from having our own room is that we can't leave all our stuff out all the time. It might sound like a little thing but it's very convenient not to have to pack up and lock up everything every single time you leave the room. Generally, doubles are a little more expensive, but the small difference is worth it. The other problem with dorm rooms (if it's hot) is that usually the fan in the room does you no good...especially if you're on the bottom bunk. Usually the rooms are pretty large and the ceiling fan is situated such that the air from it blows on nobody...although the circulation can help a bit on those humid nights. When we got to our room, it was pretty warm in there...but it being the middle of the day, you can never tell. The hostel was split into two buildings so our room was across the street and not really in the main part where the kitchen and the bar were...which is good and bad...your room is a bit more quiet, but you have to go a long way to get to the action. We organized a little, locked up valuable stuff and headed over to the main building to get a look at the hostel. It was actually a pretty cool set up...there was a large outdoor area that was a courtyard that they used as a common space. It was probably about half the size of a football field with a bunch of tables going the length down the middle. They had a kitchen area out there as well that could be used and a small bar that served pretty cheap drinks. We saw a sign up for a great deal on food for that night...a hamburger/chicken sandwich with salad AND 2 beers, all for just 50 pesos (US$5). That's a great deal so we decided to hang out for that, which was to start at 5:00. As I said before, our main goal of stopping in Tulum was to try to see some Cenotes. We found out some information about that at the hostel and booked it for the next day. We hung out in one of the hammocks outside and had a few beers over the next hour or so. It was a nice lazy afternoon...there were not many people around as most of them were off at the beach and would not return until about 5:30. We met a guy, Gene/Florida who had been working at the hostel for the past 4 months. He seemed like a pretty cool guy...he had been in Mexico for about 1.5 years, having spent most of that time running a bar on Isla Mujeres. Now he was down here organizing camping tours down to a nearby bioreserve called punta allen. I had noticed it on the map and was considering making a quick stop there. He told us a little bit about the trip and we were very interested...maybe we’ll end up doing that afterall and putting off our departure from Mexico for a couple more days. It is expensive here though and we know Belize will be the same, so we really should try to focus on continuing to move forward until we get to Guatemala. We lounged in the hammocks for an hour or so and around 5:15, the bus from the beach got back and the common area filled up quickly. We actually ended up seeing Aly again...one of the girls from the school in Maine that we met back in Playa Del Carmen. I think that’s the first time that we’ve run into somebody again on the trip, but I’m sure it won’t be the last! Most people were starting to have dinner...this hostel had one of the coolest ideas I’ve seen in any hostel for dinner. They had the special as I said before, but the way the did it was they fired up a huge grill...then they give you your burger on a plate, uncooked. Each person grills there own burger, but they have tons of fresh veggies chopped up for you and all the seasoning you’ll need so you can sautee your veggies (as many as you want...you could make a meal out of them by themselves) and cook your burger as you wish. They also prepared a huge pot of mash potatoes that was just there for the taking. It was an awesome system!! It allowed them to serve the food very cheaply and quickly to a large number of people and everybody gets plenty of food! We didn’t do much the rest of the night...I played poker with a bunch of guys for a few hours and we met a ton of cool people. Everyone just hung out in the common area having beers all night and it was a blast. One funny incident happened...around 1:00 a couple people came stumbling in. About 5 minutes later, in comes a FUMING taxi driver, yelling and screaming about one of the guys he just dropped off throwing up in his cab. He was not happy to say the least. The guy who did it had already passed out and the taxi drive was demanding $50 from the other guy who rode in the cab. The problem was, the two guys didn’t know each other very well so he didn’t want to pay any money for the guy. Three different people tried to wake the other guy but it was to no avail, he was dead to the world. The whole thing was escalating and I separated myself from it, but the next day I found out the guy paid the $50 and had to get it from the other guy (who of course remembered nothing) the next day. You gotta love hostels. It was a pretty rough night of sleeping as it was VERY hot and humid in our room. I managed to sleep a bit anyway but was up early to hit the hostel breakfast. I was pleased to find it was the same cool “cook for yourself” style but this time it was free! Plenty of eggs and veggies to make a monster omelet! I met a nice lady from Fort Wayne Indiana during breakfast...a woman in her late forties who was on her own. She only had a couple weeks and said it was only the second time she had traveled like this but she wished she had done it sooner in life...but of course kids/husband etc. had gotten in the way. Not too unfamiliar of a story, but it was nice to see that she was going for it now. I guess it’s never too late, huh? The hostel actually had free internet so I was able to get in some internet time for the first time in 4 or 5 days. We have been so busy lately! At 11:30 we went to get ready to leave for the Cenotes as our guide was picking us up at noon. There ended up being 5 of us on the tour, the other three people were two young European girls and an older lady, Luciana/Italy. She must have been in her late 60’s or something and again, traveling alone. I don’t know how many times I have to tell people that ANYBODY can do this. She was older and didn’t speak much English...but her Spanish was quite good and I spent a lot of the day chatting with her...more on that in a minute. Our guide, Hugo, was a great guy...we had a nice chat about cancer research of all things during the 30 minute drive to the Cenotes. We went to a place called Dos Ojos. We parked at the entrance to the park and actually rode bikes to the entrance of the Cenotes...the mountain bikes were pretty crappy, but it was a short ride of only about 2 miles. The first Cenote we visited was AWESOME...just an amazing sight to see. 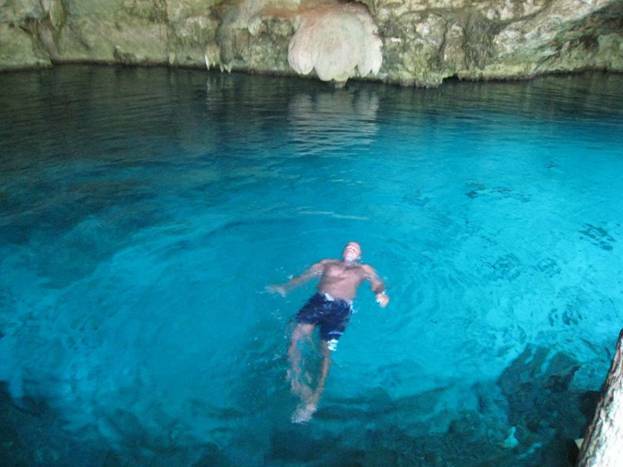 Beautiful blue water in a little cave. The water was pretty cold but we jumped right in. 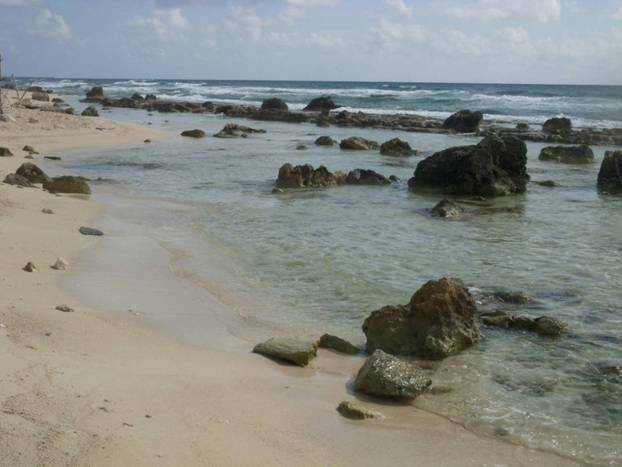 We actually had our snorkels with us and it allowed us to see how deep and beautiful it was in places. There weren’t really many fish or anything to see but with so many rocks below the surface and the deep water, the snorkel and mask were critical to being able to see where you were going and to swim for a long time. We could see many divers down below us and we really wished we had an underwater camera. We still took some nice pictures but the true beauty couldn't be seen from the surface. We were probably there for three hours and we did visit 3 different Cenotes, but our guide moved a little too fast at times. I really wanted to explore every single nook and cranny, but I still had fun diving down to the bottom and seeing what I could. The last Cenote we visited wasn’t as much in cavern as the others, but it was still beautiful. Everybody else got out of the water except for Luciana/Italy and I. She might have been in her sixties, but she was like a teenager out there in that water and she loved it! It was pretty cool. Neither of us wanted to leave yet but we had to head back...but I liked her spirit and that she wanted to get every single second she could in the Cenotes. It’s a nice way to approach life...make the most of your experiences. From talking with our guide, Hugo, and a couple people at the hostel, it seems that Dos Ojos are the best ones to visit in the area. 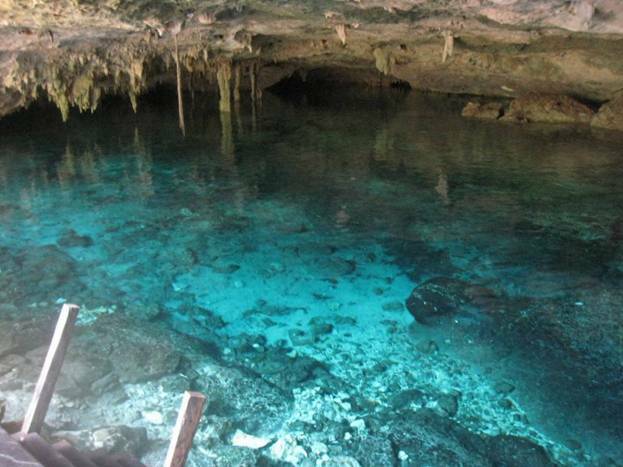 A lot of people go to the Gran Cenote, which is supposed to be nice as well, but you don’t get to swim to an underground Cavern. If you’re in this area and only have time for one day of Cenotes, I think Dos Ojos is a great option. We got Hugo to drop us off at the road leading to the beach on the way back instead of going back to the hostel. We still had a couple of hours of daylight left and didn’t want to waste them...plus it was damn hot out! It was a bit of a walk to the beach but we eventually found it. 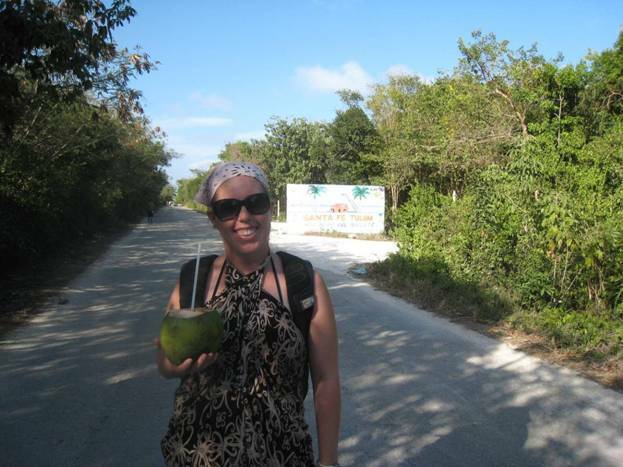 Jodi was excited because on the way she had her first coconut water ever! She looks happy in the picture, but I don’t think she was impressed:) We broke it open and tried to eat the fleshy inside, but it wasn’t ripe for some reason. I always happily gobbled that part up in Brazil when people were done drinking the water. Anyway, it must have been a 20 minute walk or so to the beach (we actually walked right past the entrance of the Tulum ruins) and Luciana and I chatted the whole time about Belize and Guatemala...turns out she had recently visited one of my favorite stops in Guatemala, Semuc Champey and she loved it. I touched on this already but I was really impressed by the energy of this old woman and her appreciation for what the world has to offer. You meet so many different kinds of travelers out there but some really stand out more than others. When we got to the beach later and we all went for a swim...the current was a little strong with some decent size waves. We were all pretty exhausted after swimming for awhile, but I don’t have to tell you that again she was the last one out of the water. She was jumping the waves and playing like she was 15 years old. I only hope I can be the same when I reach that age. It really was inspiring. The beach was beautiful by the way...and we could actually still see the Tulum Ruins in the distance. We knew it would be our last beach visit in Mexico as we were leaving the next day. One of the girls with us gave us a great idea for this picture...no mistaking where we are! Just as we were heading to catch the bus back, a huge rain cloud rolled in...but it didn’t rain until we got back to the hostel luckily. After another great “do it yourself” dinner, I lounged in the hammocks for awhile and then ended up watching a movie in the common room. Jodi was having a good time talking with Luciana and they even went out for ice cream. I was happy watching a flick, plus I wanted to leave her alone to practice her Spanish. She is making some strides and puts in a lot of effort...it’s tough when you spend a lot of time around English speaking folks though. I’m sure in the coming months she will be surprised at how much she picks up. I also want her to spend a lot of time interacting with other people that we meet without me getting in the way...I think it will allow her to get much more out of this trip...the people you meet is a big part of it. Later that night I went out for a couple beers with an Aussie guy, Paul from the hostel. He was a very interesting guy (and very cool just like all Aussies)...he has been traveling for the last 5 years, stopping a bit to work here and there. He had some great stories and some even better pictures that he showed me online (don’t have the url at the moment). 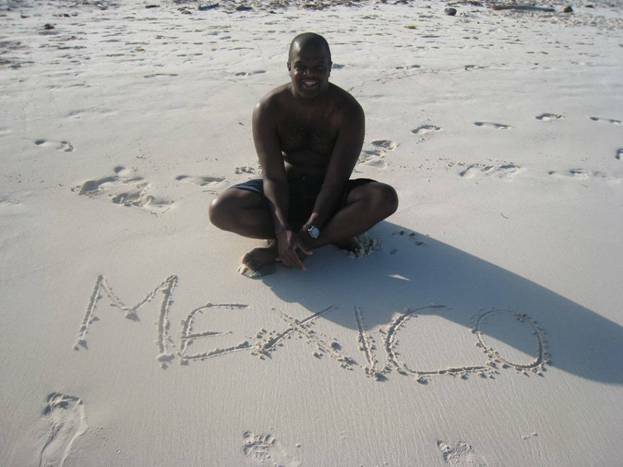 He was finishing up his time in Mexico and heading off to Ireland to work for a year. He was an electrician...which is a great skill to have as you can use that to work almost anywhere in the world and make a decent wage. Anyway, it’s always interesting to meet people like that as well b/c it reminds me of how little I’ve actually done and gives me something to aspire to. Anyway, it was a good end to a great day. You meet so many different types out there...young and on the move, old and enjoying themselves, or just somebody’s Mom that’s finally getting after her life’s dream. We all have a common thread and a common passion that brings us together and it’s a big reason why I love being in this environment. We had the great hostel breakfast once again and packed up our things. We got on the bus at noon headed to Chetmal, a city on the border of Belize and Mexico. We wanted to stop there for a day to visit a couple places that my friend Denice had suggested. One of them was the Bacalar Lagoons, which we did pass by on the bus but didn’t realize what they were until it was too late. We thought maybe we could do it the next day as it was only a bit over an hour away from Chetumal. We arrived in Chetumal and it was far bigger than we thought. It was also later in the afternoon than we figured we’d be getting there. It seemed like the bus station was a bit far from town and there wasn’t much around. We decided to stay in a place near the bus station so it would be easy for us to get a bus the next day. We actually had a really good shower in our posada...the first decent one in the many days so it’s worth mentioning. Many of the places we visit are fantastic but showers can be hit or miss...especially when there isn’t really any hot water. We haven’t had that problem too much though. I always like the little kids we come in contact with. Their curiosity never ceases to amaze me. Bed early. We got up and decided we would hit the Mayan museum in town which was the other thing I had heard about from my friend Denice. On the taxi ride into town, we got an interesting piece of information. We had heard at the bus station that there were only 3 buses to Belize each day...but our taxi driver informed us that the second class buses left more often from a different part of town. That ended up almost saving us a big hassle later on...but I’ll cover that in a second. When we got to town, we stopped and found out information about going to Bacalar, but in the end we decided to move on and not spend another day in Mexico. We found the museum and it was really nice. It seemed like they put a lot of money into it and we were surprised at how few people there were (although, it was relatively early). Despite the great set up, there were a few short comings...namely, the plaques in this museum were hurting for information. It was clear they had somebody translate them that did not really speak English well and many of them made no sense (in English). I remember seeing stuff like that in Sao Paulo...you go through the trouble to make the sign or menu in English but don’t put in the very tiny bit of effort it takes to get a native speaker to proofread it for you!? I don’t understand that. In fact, somewhere along the way in Mexico, we actually saw a sign written in English for a tattoo parlor that had words misspelled on it! That’s the one place where you definitely want to be able to spell correctly! I love latin America! Anyway, we still enjoyed the museum and learned quite a bit (thanks Denice). We grabbed a taxi back to the pousada and checked out. We headed for the bus station but when we got there, the guy told us there would be no 1:30 bus to Belize and probably no more that day. He actually suggested to us that we try to take a taxi, which would be about USD $40 instead of $5 that the bus would cost. Luckily, our taxi guy had told us about the other second class buses...but that would not leave until 3:30. The point is, this is where the advantage of being able to communicate well comes in...had we not been able to talk to that guy, we may have not known about another very easy option. In this case it didn’t matter in the end (but I’ve been saved more than once in similar situations) because at 2:00, a bus to Belize showed up anyway. I was not surprised in the least...quite often in these countries nobody has a clue what is going on. Anyway, we finally boarded a bus and were headed into Belize! 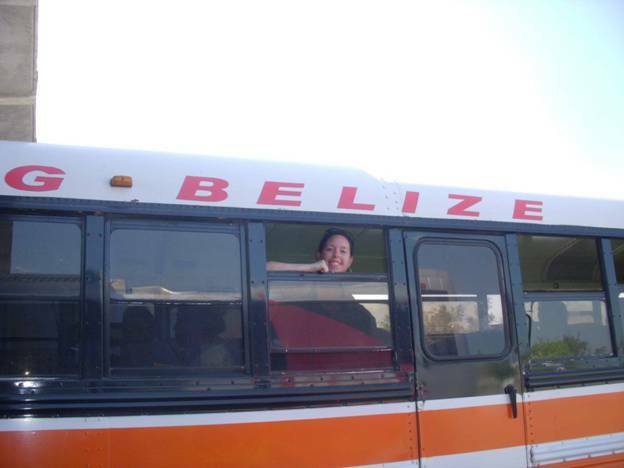 There were several other foreigners on the bus and I wondered what their stories were...were they like us, at the start of a new adventure, heading into Belize for the first time in their lives? Time would tell...but for us, it was a little sad to leave Mexico, the place that for us was the beginning of a new adventure that will take us on to many, many more wonderful experiences. 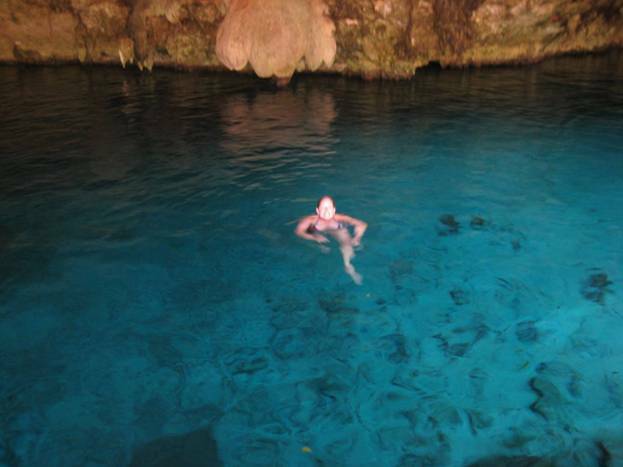 We’ll never forget the Cenotes, or floating in the salt pools in Rio Lagartos...or our wonderful traveling companions, Mark and Jo. The Yucatan was fantastic...but for now...on to the next step.